How should you prepare for data analytics after the recently released AICPA Blueprint changes? The short answer: if you’re already studying, don’t change your plans. We’ll explain. …is to breathe a sigh of relief, because what you’ve heard is misleading. a. Clarify the Section introduction. Continue reading for the full details on recent AICPA Blueprint changes, or click here. What is in fact happening is that the AICPA is adding the term “data analytics” to the AUD Blueprints, but the concept of data analytics was already present in both AUD and BEC. In short, we are going to see a change to the Blueprints, but not the exam content. Content that will be tested on and after July 1, 2019, is already being tested now. So, good news—if you’re currently studying with Gleim, you’re already studying the material you will see when you sit for your exam. We cover data analytics under “Analytical Procedures” within our AUD section, and under “Big Data and Analytics” within our BEC section, so don’t change your plans, don’t buy new materials, and don’t needlessly rush; you’re on track! Gleim has been the best choice in CPA review for over 40 years! More top 10 accounting programs choose Gleim than any other review provider, and millions of CPA Exams have been passed with our help. Our proven approach and decades of experience have set the benchmark for exam prep. We’re so confident you will pass, we also offer a no-hassle Access Until You Pass® guarantee. Want to pass with confidence and on the first try? Get Gleim CPA Review! Now, for those of you who are curious, we’ll take a close look at the exact changes in the CPA Exam Blueprints. Below are the exact changes to AUD and BEC regarding audit data and analytics. These changes can also be found in the AICPA Summary of revisions to the Uniform CPA Examination Blueprints (July 1, 2019). SUMMARY: The term “data analytics” has been added to 2 paragraphs in the Section Introduction in order to explicitly state that it is a concept within the topic being tested. There is 1 new representative task in the section covering further procedures in response to identified risks to call out data analytics specifically, 1 new representative task in the section covering analytical procedures for obtaining evidence to call out data analytics specifically, and 2 new representative tasks in the section covering all other procedures that should be used to achieve audit objectives to call out data analytics specifically. Area III of the AUD section blueprint covers performing engagement procedures and concluding on the sufficiency and appropriateness of evidence obtained, including performing specific types of procedures (e.g., analytical procedures, analytical procedures using audit data analytics, observation and inspection, recalculation and reperformance); testing the operating effectiveness of internal controls; performing tests of compliance and agreed-upon procedures; understanding and responding to specific matters that require special consideration (e.g., accounting estimates, including fair value estimates); evaluating and responding to misstatements due to error or fraud and to internal control deficiencies; obtaining management representations; and performing procedures to identify and respond to 3 subsequent events and subsequently discovered facts. Assess RMM using data analytic outputs (e.g., reports and visualizations) to determine relationships among variables and interpret results to provide a basis for developing planned audit procedures. Perform analytical procedures using data analytic outputs (e.g., reports and visualizations) to determine relationships among variables and interpret results in an audit or non-audit engagement. Determine sources, structure, and attributes of data needed to complete audit data analytic procedures. Use data analytic outputs (e.g., reports and visualizations) to determine relationships among variables and interpret results to meet objectives of planned procedures in an audit or non-audit engagement. SUMMARY: The BEC section of the Blueprints received some editorial changes which 1) added parenthetical examples to certain topics to give more guidance on the kinds of concepts that could be tested, 2) improved the consistency of some verbiage so candidates are not distracted by unimportant differences in terminology, and 3) reorganized an existing topic to help candidates better understand how IT topics will be tested (i.e., fundamental understanding, what are the risks associated with IT, and what are the controls that can be used to respond to those risks). Regarding item 3, specifically, a previously existing task within a Group B topic was split into two separate tasks. This was done in order to better distinguish three distinct approaches that make up the task as a whole. Wait, so why all the fuss? Now that you’ve seen the actual changes to the AICPA’s CPA Exam Blueprints, you might wonder why the topic is creating a lot of smoke, especially when there’s not really a fire. We asked ourselves the same question. But Gleim has been in the business longer than any other provider, and we’ve seen many exam changes over the years. 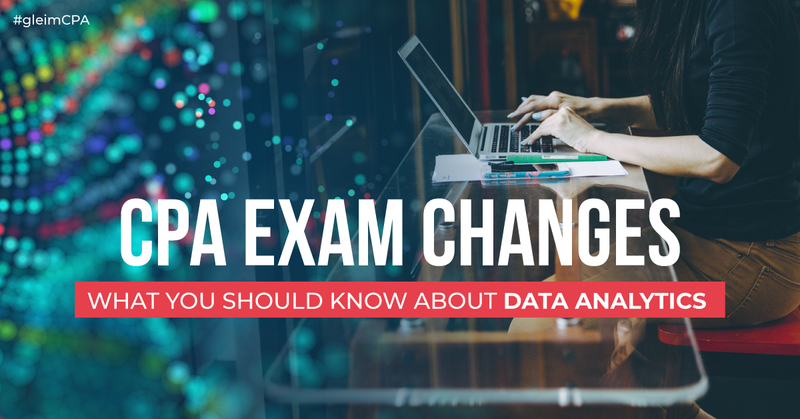 It’s not unusual for exam changes, or changes to the AICPA’s Blueprints, to cause a lot of excitement whether the changes are big or small. The CPA Exam is rigorous and intimidating. It’s easy for an opportunistic review provider to incite panic over these changes, urging candidates to rush into a purchase, and it’s just as easy for an inexperienced review provider to misinform candidates or fail to guide them through the changes. Not every exam change is a big deal, but choosing the right review provider is. Earning your CPA is a critical step toward advancing your career and achieving your goals, and preparing for the exam should never be more confusing, expensive, or difficult than it needs to be. Gleim’s advice? Always be sure that your review provider takes your success as seriously as you do.